MetaTrader 4 is one of the most popular and versatile platforms on the market today, offering powerful features to help you make educated trading decisions. Expert Advisors free you from manual trading routines. They are advanced automated trading systems written in MetaQuotes Language 4 (MQL4), that are able to analyze current market situations automatically, open/close positions and place/modify/delete orders. The Advisor can not only inform you about market conditions which fit your criteria of buying or selling, but also makes trades autonomously without trader's participation. Like most trading systems, the MetaTrader 4 terminal supports backtesting of strategies on historical data. MetaTrader 4 helps traders follow global events not drawing their attention away from the trading. Built-in news feeds provide up to date information that traders are interested in. 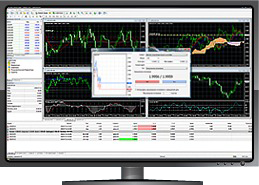 MetaTrader 4 comes out of the box with over 30 useful built-in indicators. Traders also have the ability to write their own custom indicators, using powerful MetaQuotes Language 4 (MQL4). Trailing stops are designed to lock in profit levels. Trailing stops literally trail along your increasing profit and adjust your stop loss levels accordingly. A trailing stop set for 15 pips will trigger once a trader's position is positive at least 16 pips. From this level the trailing stop will adjust pip for pip as your profit level continues to increase. A trader whose trailing stop is set to 15 pips and who is positive 20 pips has protected at least 5 pips of profit. As this trader’s position increases, their protected profit level will also grow. Once a trailing stop is triggered, a new stop loss is sent from your computer to FXCL servers. However, your computer does need to be on and running for your trailing stop to continue sending updated stop losses to our servers. Essentially, if your trailing stop has triggered ,you do have a stop loss safely in place. However, if your computer is shut down your stop loss will not continue to trail.